Title: Richey Manic: The Truth! On July 30, the Manic Street Preachers hit the stage at Glasgow's T-In-The Park Festival without guitarist Richey James. Two days later, it was announced that James was suffering from 'nervous exhaustion' and would be taking a break from the band. Naturally, the media rumour mill immediately kicked into gear. One story reported that James, who'd had a widely publicised drink problem and a history of self-mutilation, had tried to commit suicide. It was also suggested that the guitarist had quit the band for good. "Speculation that Richey is leaving the band is completely unfounded. He is, however, very ill at the moment and things have now developed to a point where the band, but more importantly Richey, have decided that he needs to seek psychiatric help to deal with what is basically a sickness." James has, in fact, been admitted to a private London clinic for treatment. The band, meanwhile, are due to play the Reading Festival on August 28 and release their third album, "The Holy Bible", two days later. And everybody still wants to know what the hell is going on with the Manic Street Preachers. "It might sound like press spiel, but Richey's always been self-abusive in terms of alcohol and stuff like that," begins vocalist/guitarist James Dean Bradfield. He and bassist Nicky Wire are in a London hotel room explaining the confused situation as best they can. 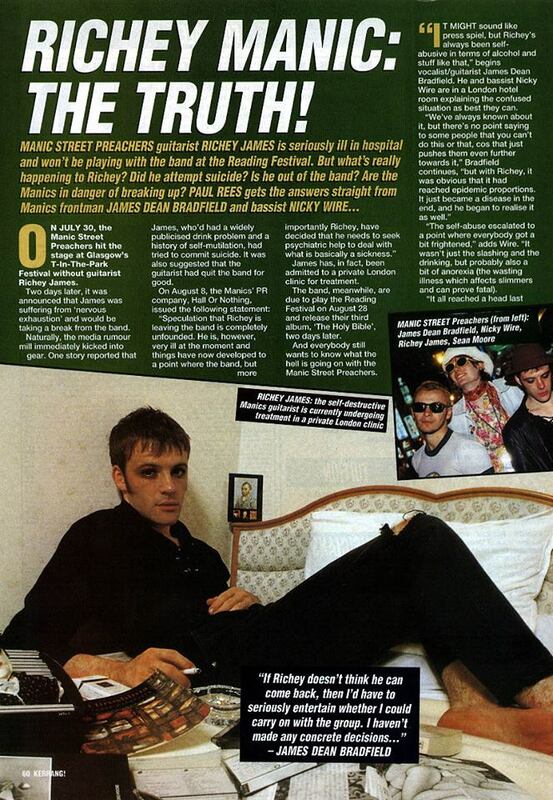 "We've always known about it, but there's no point saying to some people that you can't do this or that, cos that just pushes them even further towards it," Bradfield continues, "but with Richey, it was obvious that it had reached epidemic proportions. It just became a disease in the end, and he began to realise it as well." "The self-abuse escalated to a point where everybody got a bit frightened," adds Wire. "It wasn't just the slashing and the drinking, but probably also a bit of anorexia (the wasting illness which affects slimmers and can prove fatal). "It all reached a head last weekend. It was a bit of a mess." How accurate were the rumours of a suicide attempt? "Not at all," Bradfield responds. "Anyway, it's really irresponsible bandying words like suicide around when he's in a psychiatric state. If he'd carried on without treatment, perhaps he would've done, but he was self-abusive in a lot of ways. "You couldn't paper over the cracks any more, like he used to. More than anything, he's mentally ill."
Wire, meanwhile, has this to say: "I couldn't tell you what happened. I just saw the results. It was pretty frightening to look at. Everybody was scared. "I mean, there's a difference between carving '4 Real' into his arm and the point he's got to now. He just doesn't feel like he's got any control." Richey has previously cut himself and stubbed out cigarette butts on his arms. Is this situation anything like that? "Yeah, but times 20," says Wire. "He's just a mess. F**king nutter, the boy is! He's always tried to push himself to the limit, whether he realises that or not. But he's reached the limit, and he's got to step back from it now." What sort of treatment is Richey receiving at the moment? "He's getting all-round help, physical and psychiatric," Wire explains. "It's hard to tell how long it'll take. It's been three weeks now, and he's much more stable. I mean, he's not dribbling in the corner or anything like that! "All I can do is go there as a friend and chat. We're doing the best we can. We've put him in the best place we could, given him as much support as we can, but it's a no-win situation. You either feel guilty about it, or do something and still end up feeling guilty. "We were thinking about cancelling everything, but I talked to Richey about it and we felt it would've been a bit of a cop-out. I mean, we've got an album coming out at the end of the day. There's no point releasing it and then never doing anything else." 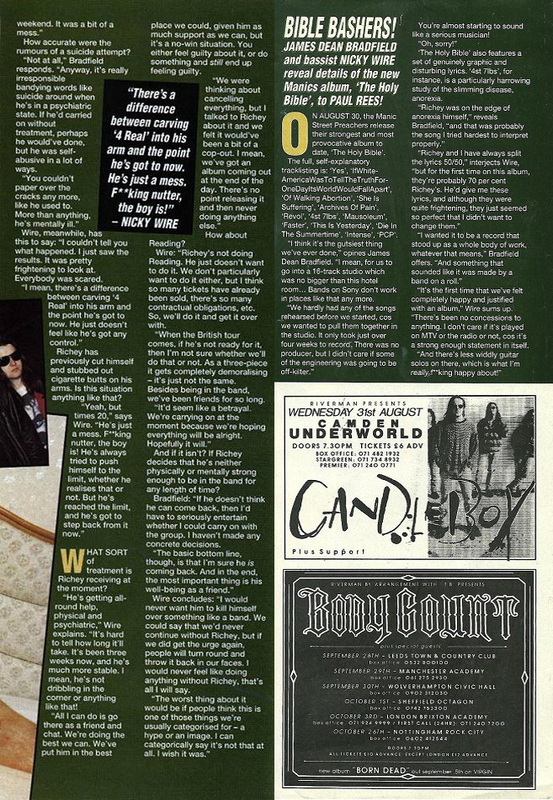 Wire: "Richey's not doing Reading. He just doesn't want to do it. We don't particularly want to do it either, but I think so many tickets have already been sold, there's so many contractual obligations, etc. So, we'll do it and get it over with. "When the British tour comes, if he's not ready for it, then I'm not sure whether we'll do that or not. As a three-piece it gets completely demoralising - it's just not the same. Besides being in the band, we've been friends for so long. "It'd seem like a betrayal. We're carrying on at the moment because we're hoping everything will be all right. Hopefully it will." And if it isn't? If Richey decides that he's neither physically or mentally strong enough to be in the band for any length of time? Bradfield: "If he doesn't think he can come back, then I'd have to seriously entertain whether I could carry on with the group. I haven't made any concrete decisions. "The basic bottom line, though, is that I'm sure he is coming back. And in the end, the most important thing is his well-being as a friend." Wire concludes: "I would never want him to kill himself over something like a band. We could say that we'd never continue without Richey, but if we did get the urge again, people will turn it round and throw it back in our faces. I would never feel like doing anything without Richey, that's all I will say. "The worst thing about it would be if people think this is one of those things we're usually categorised for - a hype or an image. I can categorically say it's not that at all. I wish it was." This page was last modified on 15 May 2018, at 05:56.